ARSENAL Ladies were among a host of teams left frustrated by the weather at the weekend after their testing Premier League fixture away against Leeds was postponed owing to a waterlogged pitch. The Gunner Girls will be hoping to return to action on Sunday when they take on West Ham in the quarter-finals of the County Cup at the Barrows Farm Stadium in Essex, kick-off is at 2pm. North London rivals Tottenham also felt the effects of the weather as their first team fixture against Crowborough was washed out. But a number of the club’s top youth teams did manage to get a run out in the Home Counties Girls League. The Spurs’ Under-11s team sealed a commanding 6-0 victory over Hitchin Town Belles. Goals from captain Emma Lee and Rachel Hands saw Tottenham go into the half-time interval boasting a 2-0 lead. A stunning second-half hat-trick from Tia Fogarty ended the game as a contest, with Hannah Fenton-Burgess adding her name to the score sheet to complete the rout. Tottenham’s Under-13s continued their winning streak with a 3-1 victory over Luton Town. 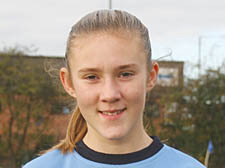 Star striker Laura Newby stole the show with an impressive hat-trick to earn the north Londoners their 11th consecutive victory. Spurs’ Under-15s completed a hat-trick of wins when they beat Kidlington Youth to seal their place in the second round of the League Cup. Tottenham took the lead midway through the first-half when Leasha Ngotho hoisted a ball into the area, only to see it bounce into the net. Chloe Gunn made it 2-0 minutes later with an unstoppable 25-yard drive. Tottenham hit the woodwork twice before finally adding a third when captain Zoë Jackson’s clearance from the halfway line deceived the keeper and bounced into an empty net. Kidlington pulled a goal back but Vanessa Hassan scored what proved to be the winner as Spurs held out in a nervous finale to clinch a thrilling 4-3 victory. SKIPPER Lucy Headford scored the winner as Hampstead beat Brentford 1-0 to book their place in the second round of the Under-14s League Cup. Brentford battled for an equaliser but couldn’t find away past keeper Emma Horrix, who put in a player of match performance to keep a deserved clean sheet. There were mixed fortunes for Hampstead’s Under-13s side who were knocked out of the cup after losing 7-1 to a very strong Forest United team. Janet Bunjo scored what proved little more than a consolation for Hampstead.